“Alexa, what's the weather like today? These are just two of the millions of searches that users conduct every day via their voice assistant devices. And on the other side of the search, marketers need to modify their SEO strategy so they’re accessible through Voice Search. Our Thoughts: Websites should always be optimized to load as quickly as possible; if it’s also an important factor in voice search SEO, then it’s more important than ever. Our Thoughts: The same as #1 — security should always be of the highest priority and its importance is clearly increased. Our Thoughts: Most of us key in less than 10 words when searching. That kind of brevity is also key for providing answers on the other end of the search. Our Thoughts: While we’ve written about the importance of Schema for SEO here, it seems that it’s not as crucial for voice search. Our Thoughts: A strong social media presence is hugely helpful for SEO. By creating engaging and shareable social content, you can improve your search ranking. Our Thoughts: We also believe in the KISS (“Keep It Simple, Silly”) philosophy. Our Thoughts: Finding efficiencies is always helpful. Skipping on these kinds of activities means we can focus on the activities that are more effective. 8. 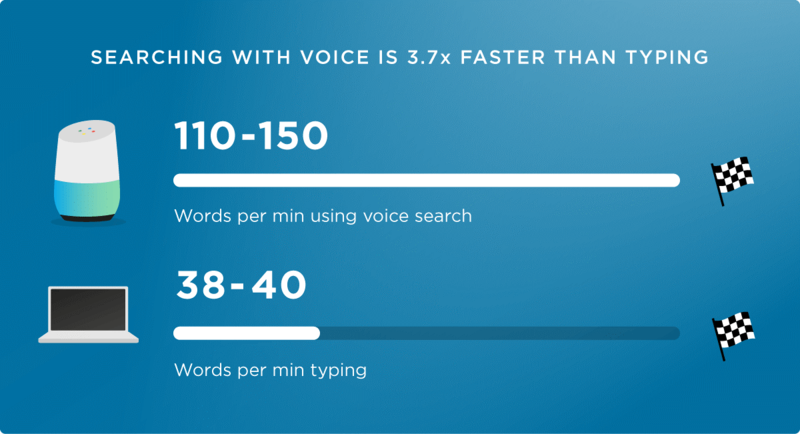 The average word count of a voice search result page is 2,312 words.Therefore, Google tends to source voice search answers from long form content. Our Thoughts: If “content is king” and long-form content is more effective for voice search, then your blog posts, case studies, and other content needs to be done well. 9. Content that ranks highly in desktop search is also very likely to appear as a voice search answer. In fact, approximately 75% of voice search results rank in the top 3 for that query. Our Thoughts: Search seems to be device-agnostic, since whatever works on a desktop will likely work on a tablet or smartphone. There are plenty of theories on how to optimize your site for voice search. Keep your user in mind. Think like a searcher and understand what they want and need from their search. Thinking about the questions they have will help you preemptively answer those questions; you can organize your site in a way that makes it easier for Google to look through your content and rank you highly in their search results. Consider other search engines. Google is #1, but there’s a pretty good reason to focus on Bing — especially since Apple’s Siri uses it as its primary engine. With a powerful customer base for iPhones, the users who search via Siri are definitely worth the effort. Make sure your “Google My Business” listing is up-to-date. As with pretty much any information online, you’ve got to be current. The more current your information in your Google My Business listing is, the more useful it is — and the more relevant your site will be to visitors. And an updated, comprehensive listing will be highly valuable for the searchers who use the mobile “Near Me” function as well. Is Schema Helpful For Voice Search Rankings? You may know that Schema.org markup — using a common vocabulary for structured data across the Internet and in email — can help search engines better understand your content. However, it’s mostly unlikely that using Schema will impact on voice search results. A recent study revealed that slightly more than 35% of voice search result pages used Schema markup — whereas the average page on the internet scores just above 30%. So overall, the difference isn’t all that noteworthy. In addition, it appears that nearly 65% of voice search results don’t use Schema at all. Each of these statistics makes a strong case that Schema does not have a strong impact on voice search rankings. However, we do want to note that when it’s used properly, Schema can improve your search visibility on any platform. Even if it won’t necessarily help with voice search SEO, it can be worthwhile. How “Loud” is the Power of Voice? More and more people are using voice search — whether it’s Google Home, Alexa, or Siri. But what are they using it for? Taking a look at their usage can give us some important insights for voice search SEO. Currently, driving directions are the #1 reason that people use voice search — which makes sense, since hands-free voice search is easier and safer when you’re behind the wheel. 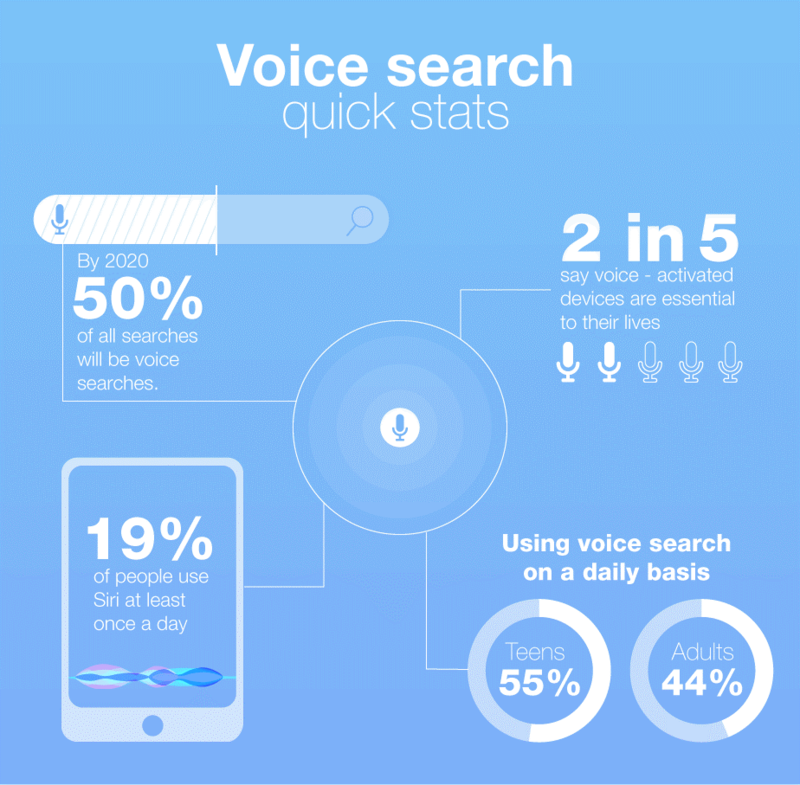 It’s important to note that voice search use will be more and more common as voice-first mobile devices become more popular around the world. Plus, many users have only recently started using voice search on a regular basis. This report predicts that smart devices will be installed in 55% of U.S. homes by 2022. In addition, more than 70 million homes will have at least one Amazon Echo, Google Home, or Sonos One — and the overall number of installed devices will exceed 175 million. But consumers don’t usually buy hardware —they want to buy great experiences, and that’s why specialization is key. Each of these devices (and others) will be competing to be the dominant controller of the kitchen, living room, and bedroom. In 2013, Google made some big changes to its core algorithm — which is the decision-making formula that chooses which search results to show users. Basically, it began placing greater importance on search queries that were in “natural language” and took context and meaning into account, instead of just individual keywords. In addition, it dug deeper into the content on individual webpages, since now it could direct users right to the most relevant page (and not just the homepage). Content writers and web developers then began optimizing their sites with natural writing — instead of forcing keywords awkwardly into sentences over and over — creating more “human” interactions in searches. This paradigm shift towards more conversational language dovetails perfectly with voice search. Because users tend to use longer search phrases, Google is better equipped to understand what they are looking for — and will deliver more accurate and relevant search results. Since Google has changed the way it conducts its searches — with a focus on more conversational language — it is well-prepared to provide on-target voice search results. Will Optimized Voice Search Bring Revenue Opportunities? There’s great potential for generating revenue via optimized voice search — especially for marketers who want to drive foot traffic to their brick-and-mortar locations. By integrating voice search with local search listings, users who are driving around and conducting “Near me” searches will find the local businesses they’re looking for. These kinds of searches have been increasing exponentially over the past several years and are most often performed via mobile devices. And while most voice assistants are free to users, advertising just might become a gold-mine opportunity for voice assistants. Of course, that means advertisers will need to have a solid brand voice strategy to go along with the business information they provide. A note of caution: Today’s savvy consumers may disapprove of ads coming from their voice assistants. Clearly, businesses will need to tread lightly here so as to not annoy customers and prospects. There are two trends that will likely lead to more focus on voice search optimization — increasingly personalized web browsing and people-based marketing. By being able to target users more specifically than ever, marketers can provide consumers with unique, individualized experiences both online and offline. Creating these customized experiences during the search process will be of paramount importance in building both brands and customer loyalty. Additionally, Google Voice Search and similar technologies are “learning” to recognize our voice commands and keywords. Over time, Google will figure out our voices, accents, and speech patterns — as well as behavior, browsing preferences, and other personal information. So, as voice search continues to become smarter, more responsive, and more accurate, marketers will need to focus on providing search engines with the information and experiences that people want. Because in the end, it’s all about Google, Alexa and Siri answering all those questions that users have. 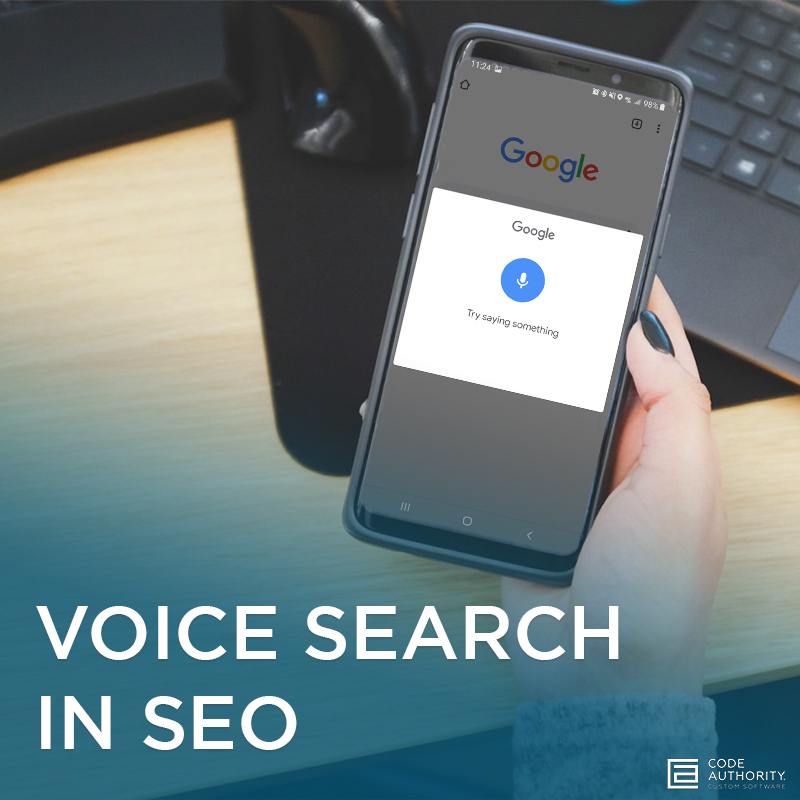 To learn more about voice search and how to get ahead of the pack on voice search integration, contact Code Authority's digital marketing team today!